Ford today celebrates the success of the Ford Focus – the UK 's most popular car – with the unveiling of a unique new model sure to melt the hearts of show goers. Roelant de Waard, chairman and managing director of Ford of Britain, today revealed, at a pre-show media conference, a life-size sculpture of the new Ford Focus Coupé-Cabriolet – made entirely of ice - at the British International Motor Show in London. 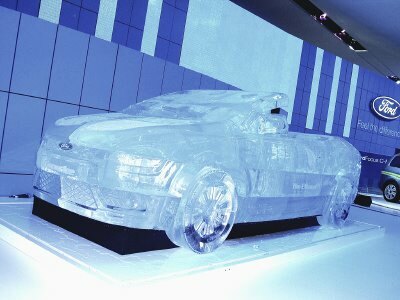 The ice sculpture, already dubbed the coolest car at the show, has been crafted for the last two weeks by a team of sculptors in a giant freezer – set at a chilly minus 10 deg C. The work took a total of 160 hours, but each shift was limited to just 40 minutes because of the severe cold. Specialist carving tools from Japan and North America , including a highly advanced, computer-driven cutting machine, have been used to 'construct' the sculpture, which is finely detailed to reflect all the elegance and style of the original. The Focus Coupe-Cabriolet sculpture, which is made from 120 separate pieces of crafted ice, was dismantled and then reconstructed on the Ford stand – which was specially reinforced to bear the weight – by a team of 12 specialists. Although it weighs more than five real Focus models – it will gradually melt and the 6,500 litres of recycled water will drain away naturally. For those people who can't see the life-size car at the opening of the show, ice-sculpting continues daily on the Ford stand throughout the event, with two sculptors working on models at the S-MAX ice bar.